Pre-order Let’s Boogie! Live From Telia Parken on all formats HERE. The 26-track Let’s Boogie! 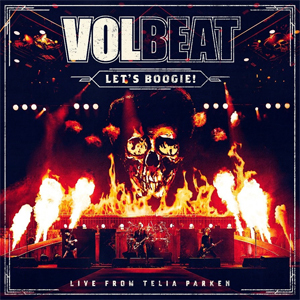 Live From Telia Parken, includes live versions of VOLBEAT’s chart-topping hits “Still Counting”, “For Evigt”, “The Devil’s Bleeding Crown” and “A Warrior’s Call” as well as a live performance of a new song, “The Everlasting”. Special guests on the album (in order of appearance) include Mille Petrozza, Johan Olsen, Mark “Barney” Greenway, Lars Ulrich, boxer Mikkel Kessler and Danko Jones. Find a full list of guest performers below. The album and concert film will be available in the following configurations: BluRay /2 CD, DVD/2 CD, 2 CD, 3 LP vinyl, and digitally. "Pool Of Booze, Booze, Booza"